Let’s take a drive through the real estate market in January 2013 and “stop” off at six quick destinations to highlight some trends in the Sacramento area. I’d be curious to hear your take too, so feel free to comment below. It’s incredible to see how the market has shifted in recent years – particularly over the past year as inventory has shrunk and foreclosure sales (REOs) have seen a massive decrease. It’s also striking to consider the total percentage of distressed sales (short sales + foreclosures) right now is less than half of what it was during January 2009. Overall it seems cash stats are fairly similar to what they were in Q4 of 2012, though maybe there was a slight dip. 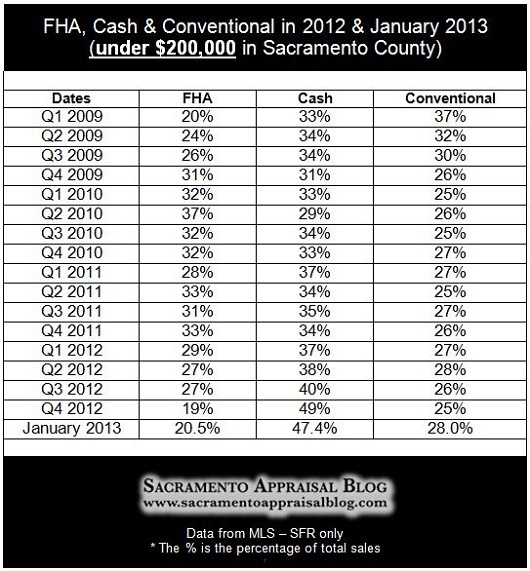 It’s remarkable to think 35.5% of all sales in Sacramento County in January were cash. Ultimately we’ll see what the numbers do through an entire quarter when there is more time to really unpack stats. Keep in mind there are far fewer sales in Yolo and Placer County, so these stats really do need more than just one month to become clear. Cash sales were very dominant during the past two quarters of 2012 under $200,000. There was overall a slight downtrend in January, but that’s only one month of data. Let’s see what happens over these next few months to really get a better picture. Will investors continue to devour the market in 2013? These figures help illustrate what it’s like in the market right now for buyers under $200,000. While it’s not always easy to get an FHA offer accepted, it’s still important to realize 1 in 5 sales are still going FHA. Cash and conventional have been the most dominant forces in the market. Anything you’d add? Realtors, what are you experiencing in the trenches? The unemployment rate is finally below double digits in Sacramento County. 9.9% is still really high, but it hasn’t been this low since January 2009. Honestly, I figured the unemployment rate would have increased recently in light of closures by Campbell Soup and Hostess, but it keeps going down. Have you been seeing these signs throughout the Sacramento area? These signs are on many properties that have been purchased by the private equity fund Blackstone (they’re buying as “THR California”). This photo was taken in Natomas, and there were actually three signs on this one street (though I could only fit two in the shot). The questions we all wonder are: 1) When will they slow down purchasing? ; and 2) Can they effectively manage such a large portfolio? Question: What else has been happening the market? What are you seeing? I’d love to hear your thoughts in the comments below. Thanks a lot for the detailed report on sacramento real estate market. Sure thing. Thank you Maria.